SEOUL -- President Moon Jae-in said Monday that Chinese President Xi Jinping is expected to visit North Korea in the near future, while the North's leader is also expected to visit Russia. Moon made the remark during a Cabinet meeting, saying U.S. President Mike Pompeo's trip to Pyongyang paved the way for an early second summit between North Korean leader Kim Jong-un and U.S. President Donald Trump. SEOUL -- South Korea's top diplomat said Monday that U.S. Secretary of State Mike Pompeo's weekend trip to North Korea appears to have been successful. SEOUL -- South Korea's national security advisor said Monday that he expects a second summit between the United States and North Korea to be held in the near future. Chung Eui-yong made the remark after U.S. Secretary of State Mike Pompeo visited North Korea on Sunday to meet with North Korean leader Kim Jong-un. 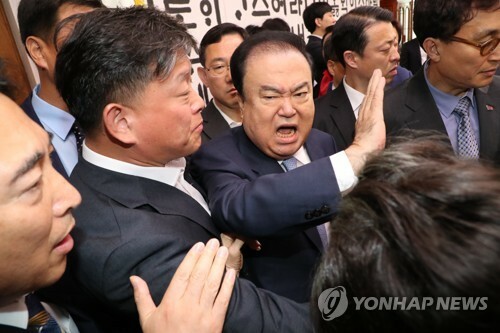 SEOUL/PYONGYANG -- South Korea has proposed holding an inter-Korean parliamentary meeting in November in Pyongyang and another gathering next year in Seoul. SEOUL -- A tour agency specializing in travel to Korea's heavily armed demilitarized zone (DMZ) said Monday it will sell a new package to the area that highlights the ecosystem and peace instead of security-centered sightseeing. DMZ Tour Korea will offer a "Cheorwon DMZ peace and eco winter travel" package from Oct. 27 to the end of March next year that features a visit to Cheorwon, a county that is situated right next to the inter-Korean border and operates a DMZ eco peace park in coordination with the environment and defense ministries.